Based on the repetition of sculpted and stylized plant motifs, this Collection is inspired by the Italian Renaissance. 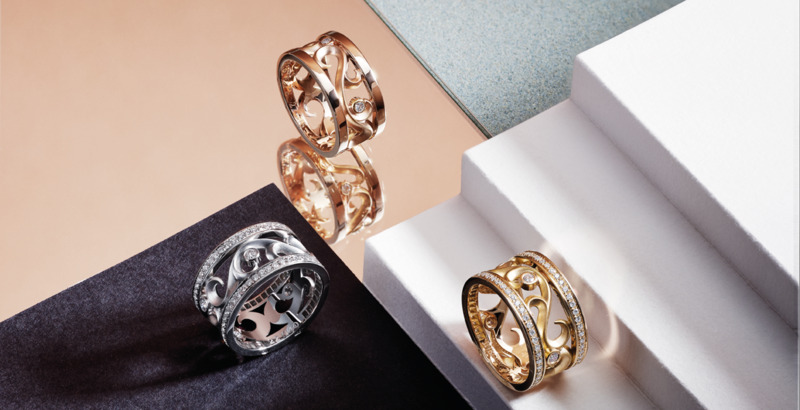 It reflects French artisanal jewellery know-how thanks to its important crimping work, the different treatments of precious metals as well as the choice of diamonds. Arabesques N°1 ring in 18k white gold, set with 5 diamonds, for a total weight of 0,23 carat.Shiny finish on sides, satin finish on the Arabesque.Price corresponds to a size n°53, smaller or larger sizes may have a different price. Arabesques N°2 ring in 18k white gold, set with diamonds on sides and with 5 diamonds on the Arabesque for a total weight of 0,75 carat.Shiny finish on sides, satin finish on the Arabesque. Price corresponds to a size n°53, smaller or larger sizes may have a different price. Arabesques N°2 ring in 18k yellow gold, set with diamonds on sides and with 5 diamonds on the Arabesque for a total weight of 0,75 carat.Shiny finish on sides, satin finish on the Arabesque. Price corresponds to a size n°53, smaller or larger sizes may have a different price. Arabesques N°2 ring in 18k pink gold, set with diamonds on sides and with 5 diamonds on the Arabesque for a total weight of 0,75 carat.Shiny finish on sides, satin finish on the Arabesque. Price corresponds to a size n°53, smaller or larger sizes may have a different price.